"First in the Hearts of His Countrymen"
Steven (Chicagoland, United States) on 22 February 2018 in Landscape & Rural and Portfolio. "First in war, first in peace, and first in the hearts of his countrymen" was a phrase that Henry Lee stated as part of his eulogy at George Washington's funeral in 1799. The Washington Monument was built between 1848 and 1884 as a tribute to George Washington's military leadership from 1775-1783 during the American Revolution. Its construction took place in two major phases, 1848-58, and 1876-84. A lack of funds, political turmoil, and uncertainty about the survival of the American Union caused the intermittent hiatus. 1. The corner stone was laid on July 4, 1848. The same trowel was used that George Washington used to lay the cornerstone of the Capitol way back in 1793. Thousands gathered around the construction site to celebrate the moment. 2. The walls of the monument are 15 feet thick at the bottom and 18 inches thick at the top. 3. The walls are covered with white marble that was brought in from Maryland. 4. While the monument is hollow on the inside, the inner walls are set with 189 memorial stones that are carved and were presented by individuals, cities, states, societies and other countries. 5. The point at which construction was stopped in 1858 can be identified as the stones used above 152 feet have a darker tone of color when compared to the original ones. 6. The Washington Monument is surrounded by flagpoles, each flag representing a state of the United States. 7. The total cost of building the monument was $1,817,710. 8. The construction of the monument was completed 30 years after the death of its architect, Robert Mills. From the archives...........Photo captured May 5, 2010. Wonderful composition, colors and reflections. Thanks for the interesting explanation. The construction of that monument has been a great work. Its proportions are enormous. The picture brings it up nicely. A spectacular image with a super sky. Superbement cadré, ciel magnifique, et idem pour les reflets. Magnifique prise de vue !!! Fantastique vue et iamge quel reflet quelle profondeur et vue superbe compo. Terrific, Steven! The perspective, the reflections, the pano- like frame ... all perfect! A very fine image and the sky is perfect; love those wispy cloud accents. The background info is so interesting. A beautiful image - like a postcard. @Jeff & Pat: I debated doing that and should have followed my instincts. Taken from a great viewpoint. A great memolrial. Cadrage, ciel et reflets superbes ! Un grand merci pour les détails ! 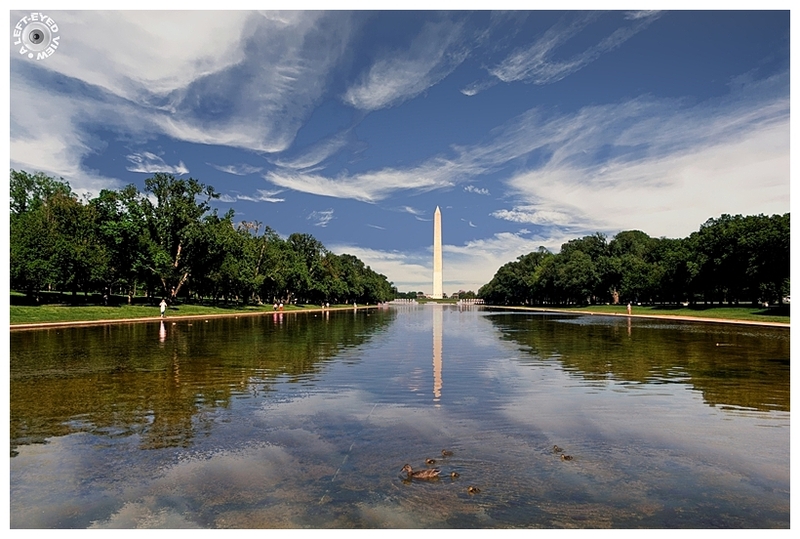 The Washington Monument leads the eye to the water and the sky. Good composition. Excellent symmetry ...! I like the reflection of the Monument. It looks much more impressive! Great shot! Wonderful photo, very well composed. Great information as well. WOW. Who knew (all that info)! The clouds seem especially excited about it all. Thank you for sharing this beautiful image and the explanation. Jolis reflets, il y a même les canards en premier plan. And even the ducks appreciate the beauty of the lake. Full of life,colors and energy. What a shot!! With that beautiful sky!! I didn't know most of those factoids!! Thanks so much! Un cadrage aux petits oignons et un bel effet miroir je dis bravo à toi ! such beautiful composition, perspective, clouds, colors, lights & reflections! Beautiful image. Amazing sky and reflection. Absolutely gorgeous! What a glorious day to take this image with that sky. I love the reflection! Wonderful information.